If these plastic green army men run into plastic green farmers, what should they do? Picture you are a member of an elite team of Navy Seals. Your assignment? Capture a terrorist leader hiding out in a mountainous forest region of Afghanistan. Your intelligence tells you that the mission should be a piece of cake, but when you are on the ground, you find quite a different story. The terrorist leader has more men and firepower than expected, and your team would be no match. Going forward with the mission would be suicide. Luckily, the enemy has not spotted you spying on him yet, so you are able to pack it up and begin marching toward an extraction zone to meet a helicopter that will whisk you and your team mates away to safety. Except there’s one hang-up. While walking through the forest, you and your team bump into couple of farmers. Your team draws their weapons, the herders don’t move. Here’s the moral dilemma – what do you do? If you let them go, they will most certainly alert the terrorists of your presence. If you kill them, you’ll get to the extraction point safely, but you risk court martial and imprisonment for killing two defenseless passersby. Even if their deaths are never discovered, YOU will know what you did and that will lead to a lifetime of guilt for you. We here at the Bookshelf Battle despise spoilers of all shapes and sizes so I’ll let you read the book or watch the recently released Mark Wahlberg movie to find out what the team decided to do, or the resulting aftermath of their decision. I don’t think it gives away anything you didn’t already know by pointing out the title of the book/movie is not called “LONE Survivor” for no reason. 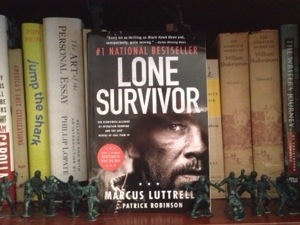 So, what would you do if you were in the position of Marcus Luttrell, the Navy Seal turned author? Would you have let the shepherds go, taken them out, thought of a third option? I deem this a shelf-worthy book due to its ability to get us to ask ourselves questions about our own beliefs and morals. Ultimately, the movie asks us to ask ourselves “If doing the right thing will cause us immeasurable suffering, will we do it anyway?” Sure we can all immediately say yes, but none of us will never really know for sure until we find ourselves in such a position.